Jaune Quick-to-See Smith was born on the Confederated Salish and Kootenai Indian Reservation in 1940, and has been creating abstract paintings, lithographs, and works of mixed media since the 1970s. In The Red Mean: Self-Portrait, Quick-to-See Smith plays with the style of Native American pictographs as well as Leonardo da Vinci’s rendition of the Vitruvian Man, which was meant to signify the ideal human proportions. In order to achieve the look of Leonardo’s work, Quick-to-See Smith had her husband twice outline her own body in an act that firmly states her subjectivity and agency. The newspaper clippings in the background are taken from her home’s tribal newspaper, The Char-Koosra News, and are positioned by the artist in such a uniform manner that seems to stretch one of the artist’s superimposed outlines to the periphery of the frame. 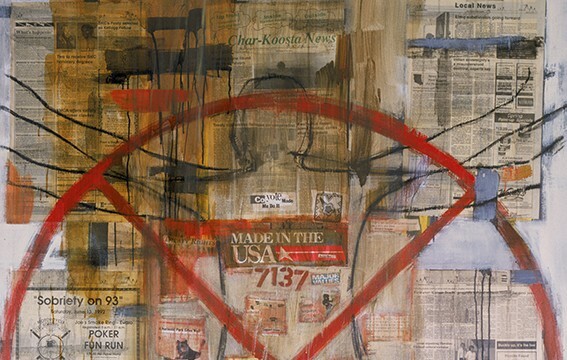 The layering of this piece is especially interesting in that the ungrounded outline of the artist is presented before the other, and also in the significance of the circular red symbol. While Native American artists have traditionally used this shape to convey the form of a medicine wheel in other works, Quick-to-See Smith’s rendition seems also to express a sentiment of negation or cancellation. 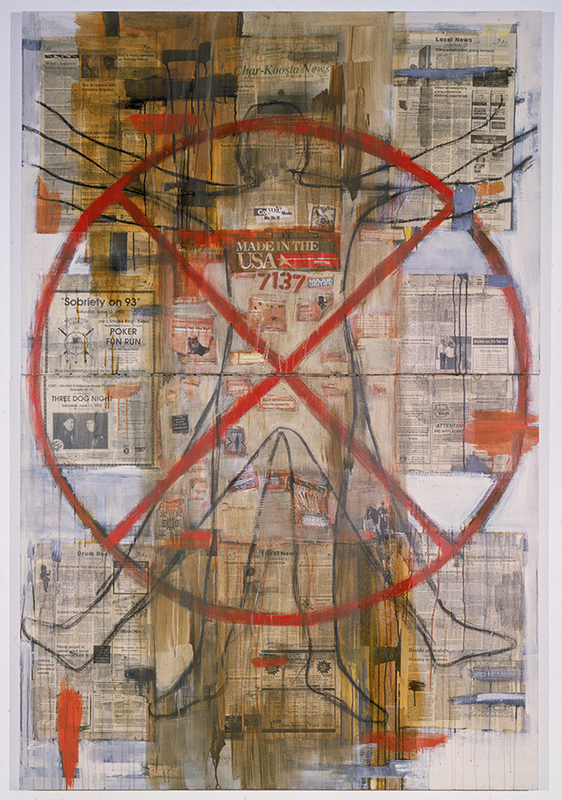 The symbolism of the numerical badge beneath the words “Made in the USA” at the center of figures’ torso is less ambiguous, as ‘7137’ is the artist’s government registration number used to identify Quick-to-See Smith as a member of a “preserved” tribal culture.